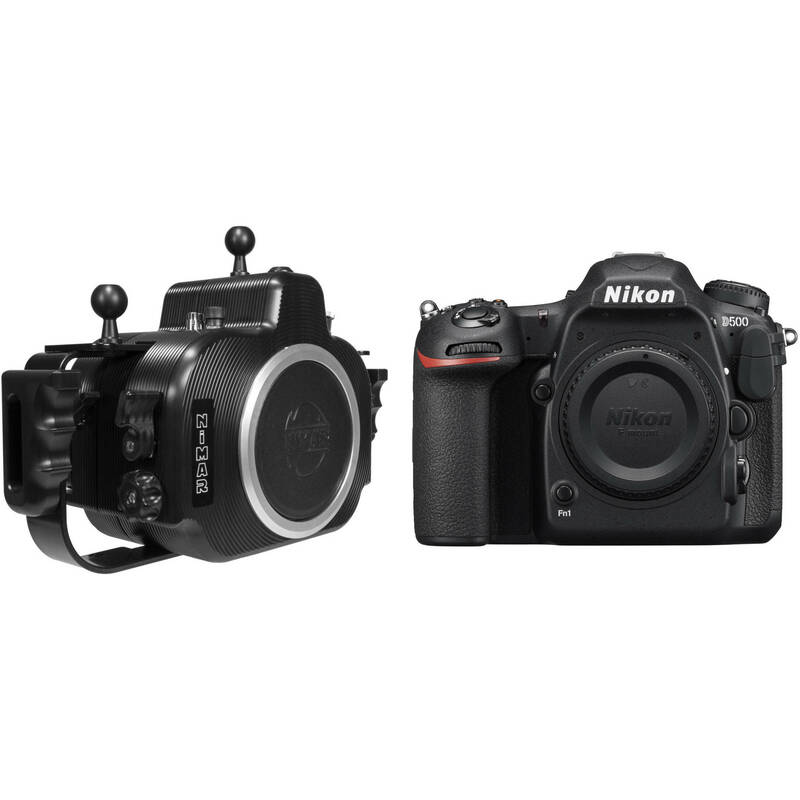 Capture 20.9MP photos and UHD 4K video deep beneath the surface with this Nimar PRO Underwater Housing and Nikon D500 Camera Body Kit from B&H. The housing is depth-rated to 328', provides mechanical control of key camera functions, and accepts separately sold a sync cord connector for strobes. The Nikon D500 features 10-fps shooting for up to 200 frames, 51200 ISO sensitivity extendable to ISO 1640000, 153-point autofocus, a tilting touchscreen and much more. Add a lens, the appropriate port, and a strobe or video light, and you're ready to make beautiful underwater images and video. With your Nikon D500 DSLR camera in this Nimar Underwater Housing, you can capture beautiful images of coral, blue hippo tang fish, and whale sharks at depths as great as 328'. The enclosure features a moisture alarm that alerts you in the unlikely event of a breach in the waterproof seal. The M14 port allows for the addition of an optional bulkhead connector to enable the hard-wiring of a strobe using a sync cord. Mechanical controls afford access to virtually all camera functions, while dual ergonomic grips improve handling and provide attachment points for optional lighting arms. The housing ships without a required lens port, and accepts interchangeable ports for many different lenses. For compatibility, please see the port chart. Built with durability in mind, the housing is crafted from corrosion-resistant polycarbonate, which is clear in the back to allow you to monitor the camera and O-ring seal. Snap-locking latches ensure that the enclosure stays shut during your dive. As the flagship model within Nikon's DX-format DSLR line, the D500 is characterized by its robust physical construction, apt imaging capabilities, and of course, a more compact, sleek form factor than its FX brethren. Revolving around a 20.9MP CMOS sensor and EXPEED 5 image processor, this camera appeals to both still and video shooters with its fast 10-fps continuous-shooting rate and 4K UHD video recording abilities. The sensor and processor also combine to avail a native sensitivity range up to ISO 51200, which can be further expanded to ISO 1640000 for working in dark and difficult lighting conditions. Benefitting the fast shooting performance, the D500 is also characterized by its expansive Multi-CAM 20K 153-point AF system, which features 99 cross-type points for fast performance and accurate subject tracking capabilities. While sleek in stature, the D500 is by no means slim on functionality and versatility. The DX-format 20.9MP CMOS sensor is paired with the EXPEED 5 image processor to provide an esteemed mixture of high sensitivity, nuanced image quality, and fast overall performance. At native values, a sensitivity range from ISO 100-51200 permits working in a broad array of lighting conditions, an can be further expanded to ISO 50-1640000 (Lo 1 to Hi 5) to handle the most challenging of situations. The mixture of resolution and sensor size also contributes to clean image quality and smooth color transitions with reduced noise throughout the sensitivity range. In addition to benefitting image quality, the EXPEED 5 processor also affords a wealth of speed throughout the camera system, including a top continuous shooting rate of 10 fps with full-time autofocus and exposure metering. Up to 200 frames can be recorded in a single burst, even when shooting 14-bit lossless compressed NEF files. Additionally, slower continuous shooting rates are available as well as a Quiet Continuous Mode for shooting 3 fps in noise-sensitivity areas. 4K UHD movie image format is an area that provides a 1.5x increase in the effective focal length of the lens in use and is reserved for 4K 3840 x 2160 recording. 1.3x-based movie image area provides a 1.3x crop of the DX sensor, and is used for recording FULL HD and HD video. DX-based movie image format utilizes the full width of the DX-format sensor, and is used to record Full HD 1920 x 1080 and HD 1280 x 720 video. This setting is well-suited for shallow depth of field effects and provides the widest field of view. As with still shooting, the wide range of sensitivities is available for recording in low- and bright-light conditions, ranging from expanded ISO 100-1640000, and sensitivity values are manually adjustable via the dedicated movie-shooting menu. Also, a video-optimized Flat Picture Control mode can be used during recording to flatten the overall contrast curve for more control during post-production and color grading. Benefitting handheld shooting, an Electronic Vibration Reduction feature can be used during Full HD and HD recording, which minimizes the appearance of camera shake across three axes to control horizontal, vertical, and rotational movements. Additionally, Active D-Lighting can also be employed during Full HD/HD shooting to preserve highlight and shadow detail when working in high-contrast situations. In regard to handling, a dedicated power aperture button (Pv) makes it possible to achieve smooth, continuous exposure transitions when switching from light to dark areas and Auto ISO can also be used to maintain consistent brightness when working in changing light situations. Audio recording can be handled using the built-in stereo microphone or an optional external mic can be added via the 3.5mm stereo jack for greater control over quality. Regardless if using the in-camera mic or an external mic, audio levels can be adjusted in 20 increments and live monitoring is possible via the headphone jack, which afford 30 different volume levels for playback. In addition to straight movie recording, time-lapse recording, for up to 9999 consecutive frames shot over the course of up to one week, is also possible with up to 4K UHD/30p output from the camera. Matching the speed and imaging capabilities is the apt Multi-CAM 20K AF system, which features 153 total phase-detection points, including 99 cross-type sensors for improved subject recognition, and 55 of the points are selectable for greater compositional freedom. Benefitting the use of super telephoto lenses and teleconverters, 15 of the points, including 9 selectable points, are compatible with an effective aperture of f/8 and all 153 points support working with effective apertures of f/5.6 or brighter. Complementing the abundance of focusing points is a dedicated AF engine, which offers quick response times to benefit tracking fast and randomly moving subjects, even at the top 10 fps shooting rate. The AF engine also contributes to enhanced focusing sensitivity, with all points capable of focusing -3 EV and the center point capable of reading at -4 EV for working in very dark, low-contrast situations. Single-Point AF: The camera uses a single point to find focus. Dynamic-Area AF: Available with 25, 72, or 153-point selections, this mode uses a primary single focus point to lock onto focus, and then makes use of the surrounding points for maintaining focus while tracking erratically-moving subjects. Group-Area AF: This mode treats smaller groups of AF points as a single point for a wider field of recognition, and is well-suited to tracking faces or other detailed subjects. 3D-Tracking: Using a subject's color information, this mode utilizes all 153 points to maintain focus on a moving subject while half-pressing the shutter button. Auto-Area AF: This mode makes use of all 153 points to quickly identify the main subject, and then prioritizes recognized faces as portrait subjects in any AF servo mode. In addition to the range of AF-area modes, an AF lock-on function can also be used to improve subject tracking performance, and can be adjusted by two parameters-quick or delayed blacked shot AF response and erratic or steady subject movement. By configuring these settings, the AF performance can be optimized to handle a wide variety of subject movement types. Lastly, a unique auto AF fine-tune function can be employed to ensure the best possible focus for each mounted lens. Rather than relying on photographing distance charts, this function lets you achieve precise focus manually in live view, and then have the AF system calibrate itself to the fine-tuned focus position in order to alleviate front- and back-focusing issues. A large 3.2" rear LCD monitor features a high 2,359k-dot resolution for clear, vivid playback and live view shooting. The monitor is also a touchscreen for more intuitive menu navigation and settings control, and is usable while shooting, giving you the ability to choose a focus point or an area to set the white balance from. The screen can also be used as a keyboard for quickly entering notes, copyright info, or IPTC information. Additionally, it features a tilting design for easier visibility when shooting from high and low working angles. A bright pentaprism optical viewfinder offers 100% frame coverage and a 1.0x magnification, and incorporates an organic EL display system to provide shooting information for seamless adjustment over camera settings without removing your eye from the viewfinder. Additionally, the optical glass features enhanced coatings for increased brightness, contrast, and color neutrality for more lifelike viewing. Extending file saving capabilities by permitting overflow recording, in-camera file duplicating, or the ability to segregate raw and JPEG files between two cards, the D500 is configured with both SD and XQD memory card slots. A robust magnesium alloy chassis is both dust- and weather-resistant to benefit working in harsh climates and inclement conditions. The ergonomic grip and overall form factor are shaped to benefit handling for extended periods of time and are further accentuated by anti-slip, textured controls and easy-to-open card slot covers. Additionally, most of the rear buttons on the rear of the camera are illuminated for greater visibility when working in dim lighting conditions. Two configurable Fn buttons, one front-facing and the other rear-facing, may be assigned for checking depth of field or used for other shooting controls. The included EN-EL15 rechargeable lithium-ion battery is CIPA-rated to last for approximately 1240 shots per charge in single-frame release modes. The optional MB-D17 Multi-Power Battery Pack can also be added to further extend shooting times. Supporting a wealth of sharing and tagging possibilities, the D500 features built-in SnapBridge Wi-Fi connectivity to enable seamless transfer of imagery as well as remote shooting capabilities. BLE – Bluetooth Low Energy technology enables communication between the camera and a smart device. Additionally, the mobile device can remotely trigger the shutter and display a live view image from the camera to enable working from a distance. NFC (Near Field Communication) is also supported to provide a quick and simple tap-to-connect method for linking your mobile devices with the camera. For faster wireless performance, the D500 is also compatible with the optional WT-7A Wireless Transmitter enabling transmission of image files via FTP server or computer at speeds of up to 866.7 Mbps. The intelligent Scene Recognition System with 3D Color Matrix Metering III utilizes a 180k-pixel RGB sensor to evaluate and analyze all aspects within a scene, including brightness, contrast, subject distance, and the scene colors, to quickly determine an accurate exposure and white balance setting to best render the scene at hand. The information gathered is also checked against onboard reference images to ensure consistency from image to image in regard to exposure, white balance, i-TTL flash settings, and subject-tracking AF performance. Three types of auto white balance are available: Auto 0, which maintains natural white values under any lighting condition; Auto 1, which maintains a balances of color between the subject and ambient light conditions; and Auto 2, which renders colors with a natural warmth and retains the colors of various types of lighting. In-camera flicker reduction is available for both stills shooting and movie recording. Three different sizes of raw files can be used depending on your output needs; raw size medium and small are 12-bit lossless compressed NEF files while the large file size is a 14-bit lossless uncompressed or compressed NEF file. Spot White Balance control for live view shooting makes setting the white balance as easy as pointing to the area in the frame that should be white. Additionally, 1-6 preset white balance settings can be stored for easier switching between different light sources. The D500 is compatible with the radio-controlled Advanced Wireless Lighting system, which permits working with the optional WR-R10 Controller and WR-A10 Receiver, along with the SB-5000, for intuitive, controllable wireless flash shooting. Picture Control modes allow you to set predefined looks to imagery in-camera and include Landscape, Monochrome, Neutral, Portrait, Standard, Vivid, Flat, and user-customizable settings. Box Dimensions (LxWxH) 9.7 x 6.4 x 5.8"